Thus, for over 1280 years, the sandalwood image was kept and worshipped in West India. Then it was taken to Kucha4 and was there for 66 years. Later, it was worshipped respectively in Liang Zhou5 for 14 years, Chang’an6 for 17 years, Jiang Nan7 for 173 years, and Huai Nan8 for 367 years. Then it was taken back to Jiang Nan and kept there for 21 years. After that it was in Bian Jing9 for 176 years. Later, it was taken to Yan Jing10 and enshrined in Sheng An Temple for 12 years. Then it was taken northward to Shang Jing11 and worshipped in Great Chu Qing Temple for 20 years. Taken back southward to Zhong Du12，it was preserved in the Inner Hall (Nei Dian) for 45 years. From the time before the Yuan Dynasty to the Year Ding Chou13，it was enshrined in Sheng An Temple for 45 years. From then to the Twelfth Year of the Yuan Dynasty14，it was worshipped in the Ren Zhi Hall of Wan Shou Mountain. Later it was moved to Da Sheng Wan An Temple. In the beginning of the Ming Dynasty, it was kept in Qing Shou Temple. As the temple suffered damages in the Seventeenth Year of Jia Jing Period15，the image was transferred to Jiu Feng Temple and worshipped there for 128 years. In the Fourth Year after Emperor Kang Xi took the throne16，he had Hong Ren Temple built so that he could worship and make offerings to the Buddha image. Because of the Geng Zi Coup D’etat17 in Guang Xu Period18，Hong Ren Temple suffered hardships of war, and the sandalwood image of the Buddha was thus lost. Only this painting which was copied from the sandalwood image survived the disasters. It was then worshipped in Tai He Hall. As the hall later collapsed, the painting was preserved in the Exhibition Hall of Antiques. Because the country suffered wars and natural disasters frequently in recent years, the members of the Dharma Association to Protect the Country held the grand Dharma ceremonies to worship the painting of the first sandalwood image of Shakyamuni Buddha from Sep.9 to Sep. 28, 1932 on the Lunar Calendar. 1. Trayastrimsas: the heavens of the thirty-three devas, the second of the desire-heavens, the heaven of Indra. 2. Udayana: also called Udayana Vatsa, king of Kausambi and contemporary of Shakyamuni Buddha, who is reputed to have made the first image of the Buddha. 3. 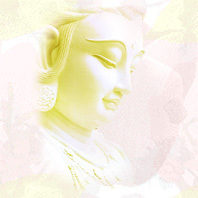 Mahamaudgalyayana: one of Shakyamuni Buddha’s ten major disciples, known as the foremost in spiritual powers. 4. Kucha: an ancient kingdom and city in eastern Turkestan, on the Silk Road. It is recorded as the native place of Kumarajiva. 5. Liang Zhou: an ancient place in Gan Su Province today. 6. Chang’an: an ancient city out of which grows today’s Xi’an. 7. Jiang Nan: an ancient name referring to today’s Nan Jing. Or, the general term for the Provinces of Jiang Su, An Hui and Jiang Xi. 8. Huai Nan: an ancient name known as Yang Zhou today. 9. Bian Jing: an ancient name known as Kai Feng today. 10. Yan Jing: an ancient name for You Zhou, a place in the southwest of Bei Jing City. 11. Shang Jing: an ancient place in Liao Ning Province today. 12. Zhong Du: Southwest of Beijing City today. 13. the year Ding Chou:1217A.D. 14. the Twelfth year(Yi Hai) of the Yuan Dynasty:1275 A.D.
15. the Seventeenth Year of Jia Jing Period: 1538 A.D.
16. the Fourth Year after Emperor Kang Xi took the throne: 1665 A.D.
17. the Geng Zi Coup D’etat: an incident taking place in the year of 1900 when the so-called Eight-Power Allied Forces (aggressive troops sent by Britain, the United States, Germany, France, tsarist Russia, Japan, Italy and Austria in 1900, to suppress the anti-imperialist Yihetuan Movement of the Chinese people, known to the West as the Boxer Rebellion) assaulted Beijing, and forced the Qing government to sign a treaty in the next year, known later as the Xin Chou Treaty. 18. GuangXu Period: 1875-1908 A.D.